The Apprentice Logistics Associate will work as part of a team which plans and coordinates transport routes across Ireland, the UK and Europe as well as daily manpower allocations in Dublin, London & Frankfurt. The Apprentice Logistics Associate is linked to the Logistics Associate Apprenticeship run in conjunction with DIT and the Freight Transport Association of Ireland. The successful candidate will be trained to perform administrative tasks efficiently and to a high standard, in accordance with standard operating procedures. After training, the successful candidate will ensure all queries and requests are dealt with promptly and professionally. S/he will be responsible for the preparation of documentation, maintaining files and completing financial transactions. Assisting our Planning Team with daily and weekly activities to ensure effective use of resources. Ensuring proofs of delivery are actively managed in a timely manner. Liaising with clients, sub-contractors, overseas offices and agents. Communicating with customers and understanding customer requirements. 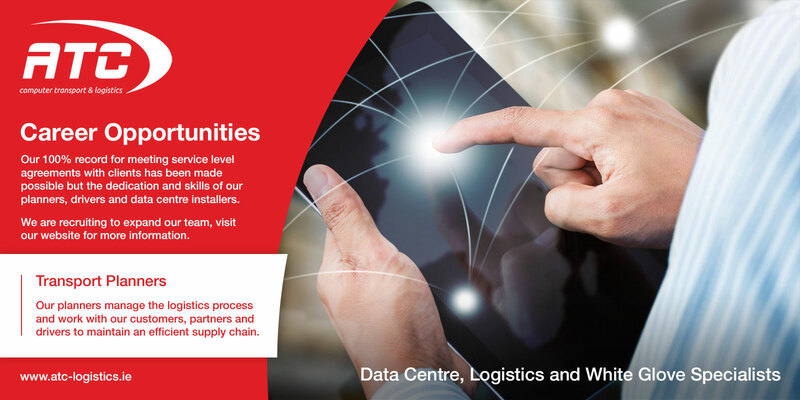 The Apprentice Logistics Associate will be based between our Headquarters in Citywest Business Campus our Operations Centre in Greenogue Industrial Estate. A strong willingness to learn in the area of transport planning, document control & record keeping. A strong willingness to learn in the area of financial logistics, including administrative aspects such as billing, quotations and invoicing. A passion for delivering superior customer service. An ability to learn how to operate in a fast-paced ‘white glove’ service provider – serving world-class global technology companies. A focus on results, demonstrating a “can-do” attitude. Experience of Microsoft products in a corporate environment, including Office 365 and SharePoint. ATC Computer Transport & Logistics is committed to rewarding employees. The Apprentice Logistics Associate role carries a base salary with an incremental increase in year 2 provided that excellent standards of work and academic performance are met. The Apprentice Logistics Associate role is a two-year fixed term contract with the following salary scale. At the successful completion of the contract, including successful completion of the apprenticeship, the candidate is eligible to apply for a permanent position with ATC. Year 2 – €25,565 subject to both satisfactory work and academic performance. DIT course fees may be reimbursed at the end of each academic year subject to exam/academic performance, with 100% reimbursement for the highest grade, and pro-rated if lower grades are achieved. Training will be provided for all workplace systems and procedures. A workplace mentor will guide the Apprentice Logistics Associate through their work placement and provide input into other relevant aspects of the course and career development. Note: Candidates are required to have the right to work in the EU/EEA. ATC does not sponsor applications for visas.